A blog reader in Egypt read my post on stamps from Qatar and said she was inspired to send me a postcard from Egypt. Egypt! I hadn't even realized I had regular blog readers in Egypt! (Guess I need to comb those groovy usage statistics more often.) I don't like to obsess about mail from particular locations, but it's just plain true that I get a plethora of mail from Germany and Finland, and precious little from the middle east or Africa. In fact, I believe this postcard is my first mail from Egypt, and I am quite taken with the iconic stamps. Maybe they're common over there, but they're pretty cool to me! They came on this postcard. I can't tell what it is, because the stamps are partly covering the location, but it looks to be an older photo. And while I'm sharing cool stamps, I got this stamp on a Postcrossing card today. 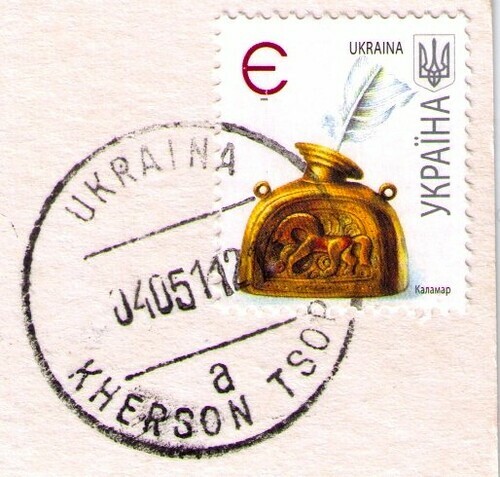 I get a fair number from the Ukraine, but I've never seen this awesome inkwell stamp before! It's worth noting that although it is postmarked 4 May 2011, the Postcrossing system lists it "sent" on July 10, 299 days ago! That is my record for longest "travel" time on a received postcard. My guess is, she just never actually sent it until May; that is a less frightening thought than the possibility that she DID send it in July, and they only got around to postmarking it and sending it over here this month. Annoyingly, it was one of those postcards that has nothing written on it except my address and the postcard ID - not even a "Happy Postcrossing" or "Greetings," but oh well. I'm pretty psyched by the stamp. Wonderful post. I really enjoy the stamps that come to Box652. sometimes I try to find out what the stamp is about, usually something wonderful, or important in that country's history. and those Finnish stamps, vegetables with faces to add... brilliant. I appreciate your highlighting the stamps. Life is too short to use boring stamps.! 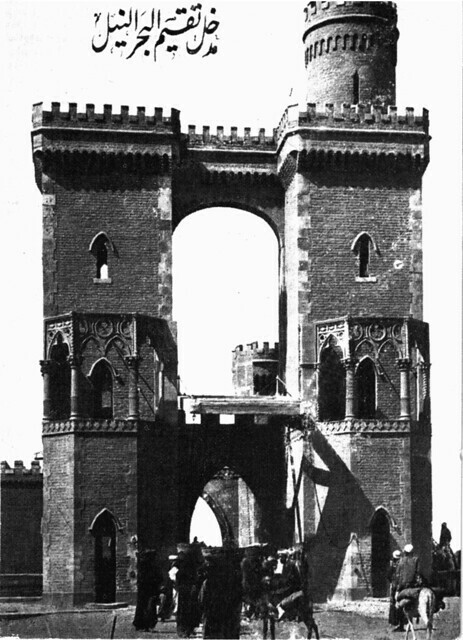 The postcard looks like one of the entrances to the Nile Delta Barrage (the Arabic says "entrance (something) the river Nile", where (something) is a word that exceeds my feeble command of the language).